A Cappella music recorded live in the chapel of Dominican Hospital, Santa Cruz, California; Chapel of the Chimes, Oakland, California; and Dance Palace, Point Reyes, California. We join the family of singer Jane H. Saline (1925 – 2002) in honoring the loving memory of their mother and wife. Jane’s generosity, grace, and love of harmony live on. We are grateful for her family’s support, which made this CD possible. Singing at bedsides is a calling that invites us to be sacred instruments and empowers our voices to be kind, courageous, and creative. 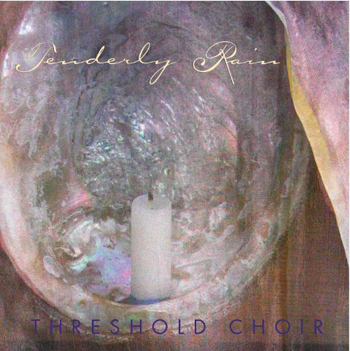 Tenderly Rain has 27 songs written by choir members and friends of Threshold Choir. We are grateful to the friends of Threshold Choir for their generosity with their songs and their poetry. And we love singing our sisters’ songs. See dedication and lyrics here.